MFT Graphics Guru Laina Lamb, Design Team Member Teri Anderson, and Contributing Design Team Member Karolyn Loncon all raved about this inventive design by Nikki. 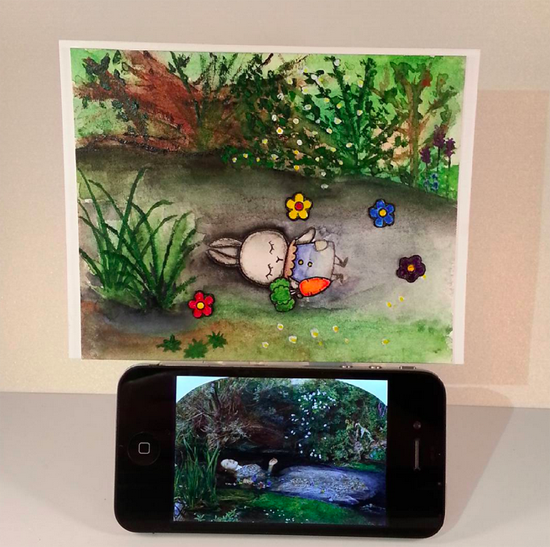 Nikki was inspired to create this card after tuning in to an all day Periscope from Sandy Allnock. Laina said about the card, "I die." Teri said, "I don’t even know where to start other than to say this card is amazing." And Karolyn said, "Oh yeah — mind blown on that one, too! Absolutely incredible!!" 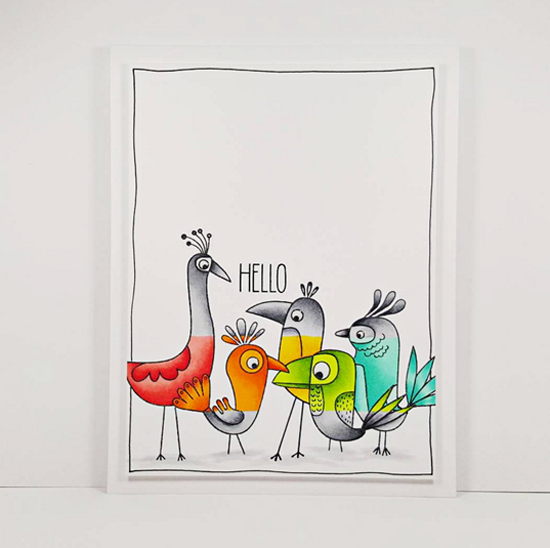 Our Birds of Paradise stamp set looks pretty stinking cool like this, don't you agree? Challenge Team Member Jill Dewey Hawkins spotted this masterpiece on Instagram. Jenny Lee says that she was inspired by Sir John Everett Millais's painting Ophelia. How fun to see our sweet bunny from the Somebunny stamp set as the centerpiece of a classic 19th century work of art! I spotted Diane's card as part of our Card Design Superstar contest back in September, but I thought that this design was fitting for a November post. I love the drama Diane created with black and metallic gold and her use of the Fall Florals and Thanks So Very Much stamp sets. I particularly enjoyed how she repeated the word grateful to create the background. She did a wonderful job masking the sentiment and the angle of the words give her design energy. MFT Social Media Maven Erica Hernandez spotted this suberbly executed design by Ksenija on Instagram through the hashtag #mftstamps. Ksenija features two of the smaller stamps from the Jingle All the Way stamp set. I love her repetition of the gifts and how she colored them in three different ways to add interest to her design. The sweet little girl appears to be looking at the sentiment. SO cute! This card employs both the rule of thirds and repetition which we covered in our MFT Summer School sessions. Well done, Ksenija! Contributing Design Team Member Inge Groot spotted Sandra's cute circular tag/card on her blog. 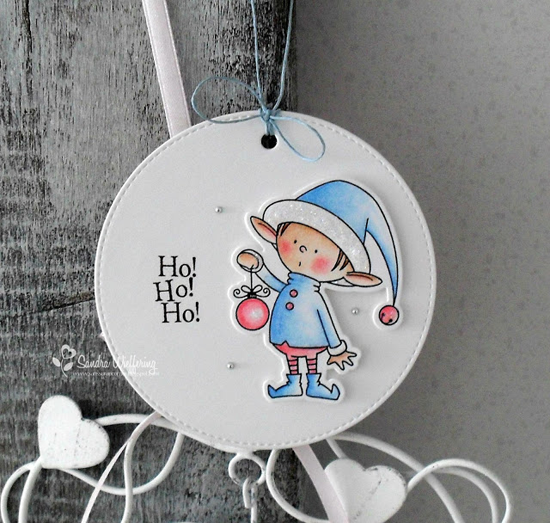 I love the soft pastel hues that Sandra chose with our whimsical elfin pal from the Santa's Elves stamp set. The light blue string, little pearls, and bit of sparkle really make this an adorable design. Thanks for using MFT, ladies! You've left us inspired, and that's what it's all about! See you tomorrow for the next Sketch Challenge, and look for a new MFT Color Challenge on Thursday, November 12th! Oh! Thanks for spotting my card :) Congrats to all ladies, whose creations were spotted! Thanks so much for spotting my card, and congratulations to the creators of the other spotted projects, they're all wonderful!! My favorite is Jenny Lee's card, I love this kind of super charged creativity!!! These are all fabulous cards!! !